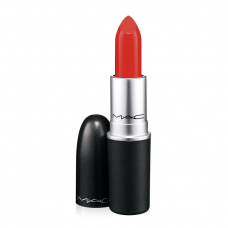 The fashion editor extraordinaire fills us in on how to make red lipstick work for you. As people who, well, face getting dressed every morning, one thing we really, truly admire is a signature. A signature ensemble, like Caroline de Maigret, who never varies from her uniform of charcoal skinny jeans and a shrugged-on CHANEL jacket. A signature cut like Leigh Lezark’s razored chop or Anna’s iconic (a word we don't use lightly around these parts) banged bob. Or a signature lip like, well, Joanna Hillman, the Style Director over at our personal fashion bible, Harper’s Bazaar. Okay, so she’s also known for her distinctive, expertly-highlighted shade of blonde and what can only be described as impeccable style (when we showed up at her apartment recently, she was wearing a striped Altuzarra blouse, ripped denim and Wang heels—so, like, the outfit of our dreams), but when we think of all the things that Hillman could teach beauty plebs such as ourselves, what we want to know most is the details on her flawless red lip. So watch and learn. And you’re welcome.